Antonín Dvořák’s next to last opera draws its substance from the underwater wonderland of little mermaids, Undines and Melusines: Rusalka, a water nymph, wishes to become human in order to be loved by the young prince. Despite being warned against it, she asks the witch Ježibaba to help her. 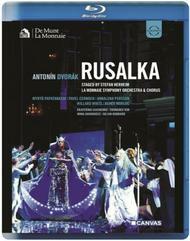 In order for her wish to be fulfilled, Rusalka must give up her voice and face eternal damnation if her love fails. Jaroslav Kvapil’s libretto inspired Dvořák to compose a masterpiece, a compelling opera full of poignant lyricism and dramatic twists. Ádám Fisher and Stefan Herheim masterfully present this ‘lyrical fairytale’ at La Monnaie, Belgium. In this widely acclaimed interpretation, the fairy tale elements assume frighteningly realistic dimensions, making this enchanting production a psychoanalytical study of male fantasies and female archetypes.